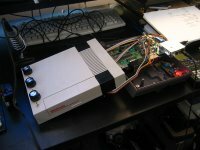 PixelForm’s work with circuit bent TI-99s has been featured before however this time the subject is an NES with a slightly different circuit. 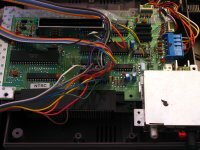 The glitch points on the NES’ VRAM IC are controlled by a super handy 4066 Quad Switch IC with control pins triggered through the use of a simple but effective OP-Amp based filter bank. The triggers from the filter bank are also fed into a counter IC which controls the second 4066 set of switches. This daisy chain is actually something similar to a sequencer with each step advanced by a strong sound from the audio input. The result is quite beautiful as seen in these video clips: Video Clip1, Video Clip2, Video Clip3, Video Clip4. 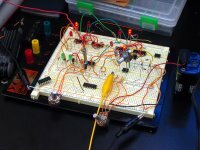 More info, schematics, and detailed explanations are available through this link and a huge thanks goes out to Phillip for deciding to share the knowledge with everyone.